We’d love your help. 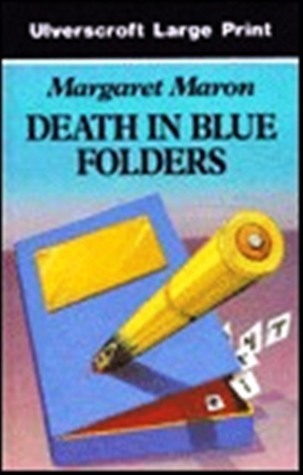 Let us know what’s wrong with this preview of Death in Blue Folders by Margaret Maron. A bullet sends a prominent lawyer into permanent retirement amid a bonfire of blackmail papers, and Harald finds a filing cabinet brimming with suspects and motives. Wading through a flurry of forged documents, trust funds, and contested annuities, Harald searches for one missing file--the one marked M for murder. To ask other readers questions about Death in Blue Folders, please sign up. I really enjoy Margaret Maron's later work and was excited to read one of her earlier works. Her solid writing style and plot twists were present in this book. The main character, Sigrid, is someone that I would like to learn more about. She appears very stoic with some quirkiness just below the surface. Interesting mysteries within the main mystery. Most importantly, short chapters and a dead body right away (the ingredients of a good mystery, per my Mama!). Sigrid is a detective in the NYPD. She is investigating the murder of a lawyer. The more she finds out about the guy the more suspects she has. He had been blackmailing sveral people and she has to find out why and who OMG them killed him. In the meantime two others associated with him are murdered with the same gun. She and her partner track down lots of leads before finally figuring it out. She also is in the process of finding a new place to live which adds a little extra stress to her life. En Sigrid is a detective in the NYPD. She is investigating the murder of a lawyer. The more she finds out about the guy the more suspects she has. He had been blackmailing sveral people and she has to find out why and who OMG them killed him. So many tangled webs! I loved following the myriad clues, teasing out the possible answers to the varied puzzles. Also enjoyable were the side plots of formalwear, apartment hunting, friendship and family and the elegance of writing. I have just begun this series, and am looking forward to many more. Errors, typos annoying. Roman, Tillie are developing nicely. Captain McKinnon's backstory interesting, not sure believable. Sigrid is a detective. Glad the apartment situation settled. I bet on the wrong horse in this whodunit. I picked this up from the library because it was there and looked somewhat interesting. It is somewhat interesting. I wavered back and forth about how much I liked it; it was easy reading, not completely obvious, and kept me turning pages, but somehow it's not compelling. I had read all of the Deborah Knot books by Maron and enjoyed them, but for some reason I had never bothered to read any of the Sigrid Harald books. I picked one up a couple of weeks ago and have found myself enjoying them. I saw the solution coming, but it was a fun puzzle mystery. I was actually expecting more character development, but the story stayed on plot the whole time. Sigrid Harald, #3 of 8, well done! "Folders" follows the basic form of most of Maron's titles -- a murder occurs fairly early in the tale, as here, often in chapter one; and we work the clues and the successor crimes with Sigrid and her police colleagues until she nabs her crook. Usually the character descriptions and set changes are what I've heretofore referred to as "minimalist", yet make no mistake that Maron is a fine writer who conveys anything she really wishes to with little difficulty. T Sigrid Harald, #3 of 8, well done! The plot provides an immediate abundance of suspects, as the blue folders in question are the "private" files set aside without even the knowledge of his staff by a killed-before-he-could-retire lawyer. It seems clear from the outset from a quick look at his bank account that he was blackmailing these special clients; while Maron chips away at first one then the other of the half dozen or more targets, she solves in an interesting way the mini-mysteries of why each person was being blackmailed. So we get some ongoing resolutions while working the main case to a conclusion, a very entertaining technique. The familiar cast members from previous and subsequent stories are just about all here, so this is a most representative member of the set. Recommended! I'm of big fan of Margaret Maron's Deborah Knott series, and I've been starting to read her Sigrid Harald series. This is the third in that series. I'm finding it difficult to get ahold of these books; I've bought two used, and I'm trying to get the rest through inter-library loan. I find Sigrid to be an extremely interesting character. She's complex, a bit standoffish, and doesn't suffer fools gladly. She's worked hard to get where she is. Death in Blue Folders is about a lawyer who seems to hav I'm of big fan of Margaret Maron's Deborah Knott series, and I've been starting to read her Sigrid Harald series. This is the third in that series. I'm finding it difficult to get ahold of these books; I've bought two used, and I'm trying to get the rest through inter-library loan. Death in Blue Folders is about a lawyer who seems to have a lucrative side business going in blackmail. He picks his "clients" carefully, and keeps their information hidden away in his desk in blue folders. His office is ransacked, and the lawyer is dead. But only a few of the folders and their contents are left. Does the timing of his murder have anything to do with the lawyer's upcoming retirement? Sigrid is left with few clues and lots of suspects--if she only knew who they were. I am reading all of the Sigrid Harald series after I read Corpus Christmas over the holidays. I don't know how I missed them since I really enjoy all of Margaret Maron's Deborah Knott books, her stand alones, and her short stories. Here Sigrid finds a new home and wears a formal gown, lipstick and nail polish. And solves an interesting murder or two or three with help from Tillie, as usual. I love seeing Sigrid reveal herself to be the lovely person she is. Looking forward to the 2017 Sigrid, to I am reading all of the Sigrid Harald series after I read Corpus Christmas over the holidays. I don't know how I missed them since I really enjoy all of Margaret Maron's Deborah Knott books, her stand alones, and her short stories. Here Sigrid finds a new home and wears a formal gown, lipstick and nail polish. And solves an interesting murder or two or three with help from Tillie, as usual. I love seeing Sigrid reveal herself to be the lovely person she is. Looking forward to the 2017 Sigrid, too. I am an old lady and enjoy mysteries. I am so happy to find authors and characters I enjoy and can rely on. Old women can't sleep as well as they used to and may need a favorite book to help them pass the nights. We don't like to keep trying insipid writers and/or series. I liked this book, third in the Sigrid Harald series because it filled in the gaps in Deborah Knott's background in that series by the same author. A lawyer is found dead in his office with many of his files burned and the office in disarray. Sigrid, a New York City detective and her team must investigate. They discover that all of the clients whose cases are in "blue folders" had secrets that could be motives for murder. An interesting side theme is Sigrid's search for a new apartment. it struck I liked this book, third in the Sigrid Harald series because it filled in the gaps in Deborah Knott's background in that series by the same author. A lawyer is found dead in his office with many of his files burned and the office in disarray. I really enjoy the Deborah Knott mysteries by this author, so I decided to try this one as well. This series is not as satisfying. The heroine, Sigrid Harald, is a bit of an 'ice queen'. While the author does give enough clues and explanations of her past, that help you understand her current state and situation, she is still a bit too much of a cold fish to really like. She is sympathetic, but just not still quite likable. She is intelligent and very capable in her job. She does very well in so I really enjoy the Deborah Knott mysteries by this author, so I decided to try this one as well. This series is not as satisfying. She is intelligent and very capable in her job. She does very well in solving the murders. I would want her on my case, if I had a mystery to solve. She's just a bit too cold for me, I think. An expensive lawyer has extremely expensive tastes, and resorts to blackmail to increase his income. When he's murdered and some of his "special" files are burned, it's up to Lt. Sigrid Harald and Sgt. Tildon of the New York City Police to tease out the various unsavory things he'd been up to, in order to find out which of his marks had killed him. The answers are convoluted, the paths leading there even more so, and the characters wonderful, especially Sigrid, always a favorite of mine. Solid, An expensive lawyer has extremely expensive tastes, and resorts to blackmail to increase his income. When he's murdered and some of his "special" files are burned, it's up to Lt. Sigrid Harald and Sgt. Tildon of the New York City Police to tease out the various unsavory things he'd been up to, in order to find out which of his marks had killed him. The answers are convoluted, the paths leading there even more so, and the characters wonderful, especially Sigrid, always a favorite of mine. Solid, entertaining, and with an extra touch of pathos, this is #3 in Ms. Maron's first series - a fine entry in an excellent series. #3 in the NYPD Lt. Sigrid Harald series. NYPD Lt. Sigrid Harald series - Attorney Clayton Gladwell keeps 'special' cases in blue folders that only he can access, but when Gladwell announces his impending retirement, someone decides that Blue Folder secrets aren't safe unless everyone connected to them is dead. From a long-dead movie star, the owner of a trendy art gallery, and an Algonquin Roundtable personality to a senile resident in a nursing home and a broken-down cleaning woman, Lt. Harald m #3 in the NYPD Lt. Sigrid Harald series. NYPD Lt. Sigrid Harald series - Attorney Clayton Gladwell keeps 'special' cases in blue folders that only he can access, but when Gladwell announces his impending retirement, someone decides that Blue Folder secrets aren't safe unless everyone connected to them is dead. From a long-dead movie star, the owner of a trendy art gallery, and an Algonquin Roundtable personality to a senile resident in a nursing home and a broken-down cleaning woman, Lt. Harald must figure out who hated or feared Gladwell enough to shoot him. The book Three Day Town is where Deborah Knott and Sigrid Harald meet. Kate's appearance in this book shows the timeline as Jake is still alive. Kate being a person in the Deborah Knott books. The author's introduction to the Harald books points out that changes in technology are to be ignored as much as possible. The current technology would not allow one mysteries solution to stand. A compelling mystery. A murdered lawyer who was planning to retire and had some special files on clients that was worth being killed for. Two other murders along the way and a surprise ending allows it to be a good read. Plenty of suspects in this third episode for Sigrid Harald, although I was correct with my choice of the primary suspect. This series is definitely not as well developedas the author's later one but it is still a pleasant diversion. Wow, what an ending! MM is usually not so shocking at the end. Sagrid is becoming more and more of an interesting person and her kindnesses in this book were enlightening.